It's almost Mother's Day 2018! Time to break those mamas away from their daily grind of work, chores and millions of other responsibilities and let the fun and festivities commence! It's time to say "Happy Mother's Day" by giving moms what they really want! It's time to lift them up in fancy chairs while singing songs about the glorious powers of womanhood! But I'll be darned if I'm not going to try and think of a couple more right after I get done here, even if it means I'll have to compose them myself! Huzzah! Let the ladies and their babies of all ages rejoice as this most glorious and brunch-filled of days is almost upon us. Have you ordered her favorite flowers yet? Have you bought her a deeply moving and meaningful card (that probably also has flowers on it)? If not, you still have some time, but it's quickly running out, y'all. After all, before you know it, the day will have arrived, and the last thing you want is to get a call FROM your own mother in which she sweetly tries to figure out if you forgot that it is Mother's Day or if you are hiding some grand surprise from her, even though, being that she is your mom and all, she knows full well that planning grand surprises is so very very far from being your forte. Fret not, my friends, because you can still make this year's Mother's Day one she won't ever forget. Go for the gold. Pull out all of the stops. What? You don't have any ideas about how to do that exactly? That's perfectly fine, because I am here to save the day for you, and I'm going to do it with just one word: MEMES. That's right, the Internet's favorite comedic device isn't just for jokes about yodeling kids in Wal-mart or cats doing funny things anymore! 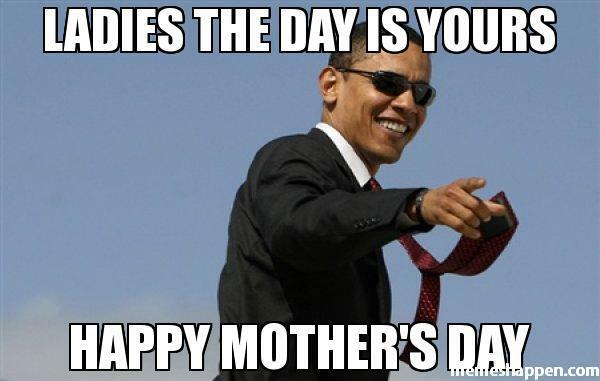 You can now find memes for every occasion, and Mother's Day is no exception! From hilarious to heartwarming, there's nothing some solid memes can't make better. 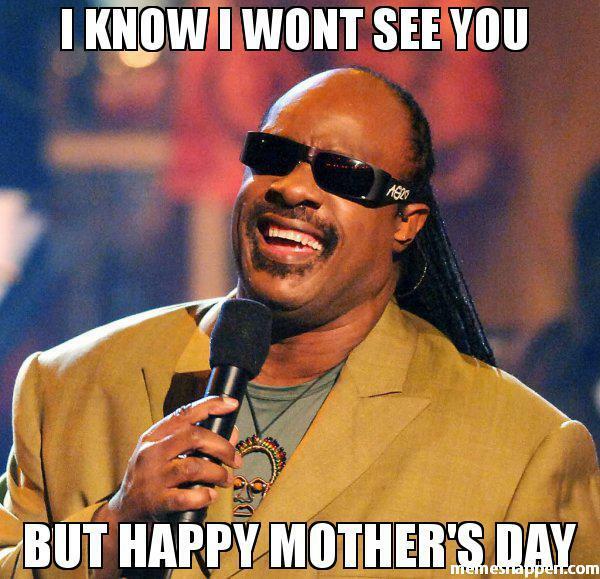 Here are the 25 best funny memes around that take saying "Happy Mother's Day" to a whole new level of amazing! 1. Remember the moment you figured this out? 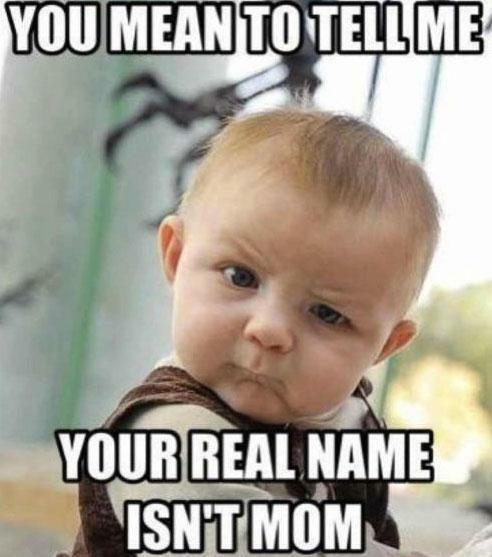 "You mean to tell me your real name isn't mom?" "Ladies, the day is yours. Happy Mother's Day!" 3. It's the thought that counts. 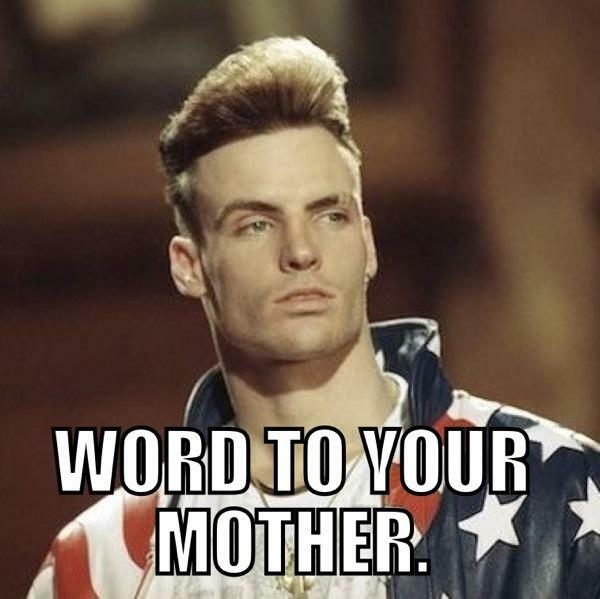 "Happy Mother's Day, Mom! I was going to serve you breakfast in bed, but I ate it." "Happy Mother's Day. 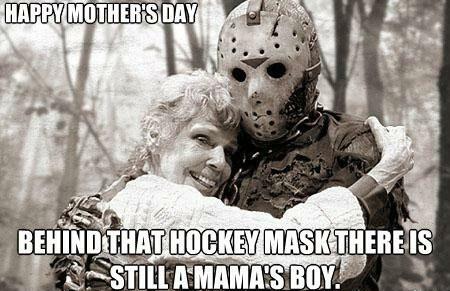 Behind that hockey mask there is still a mama's boy." 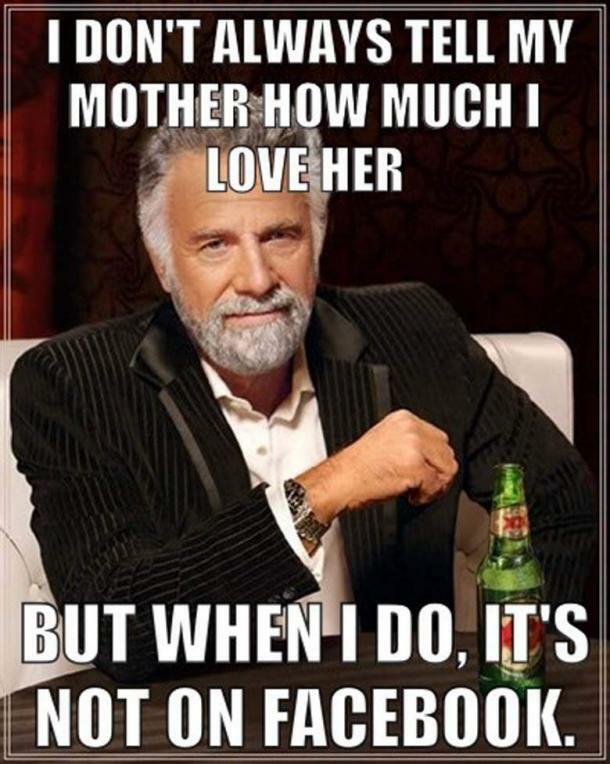 "I don't always tell my mother how much I love her, but when I do, it's not on Facebook." 6. 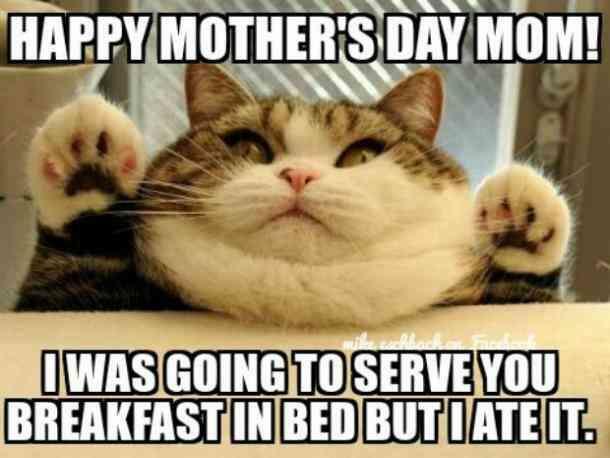 This one's for the cat loving mothers out there! "Happy Mother's Day! 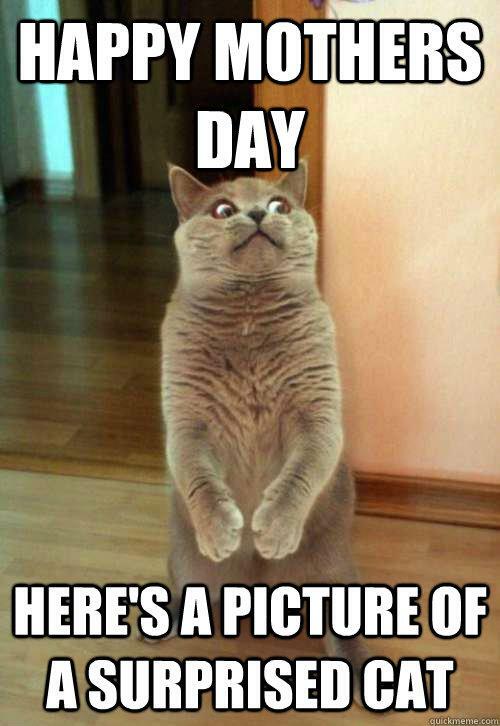 Here's a picture of a surprised cat." 7. No more wire hangers! "It's Mother's Day. 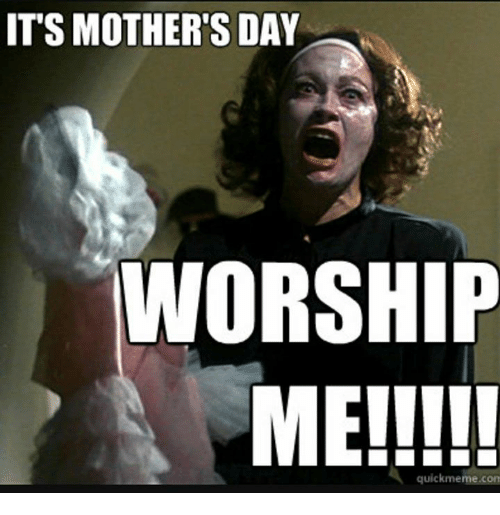 Worship me!" 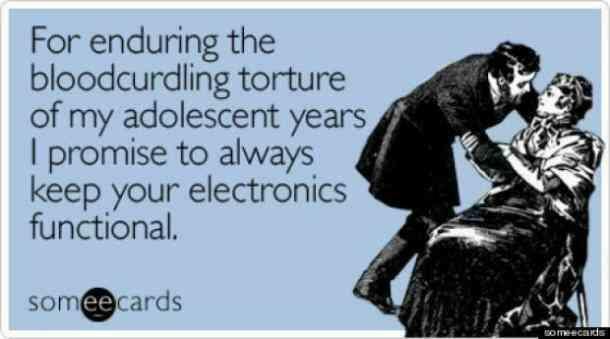 "For enduring the bloodcurdling torture of my adolescent years I promise to always keep your electronics functional." 9. Glass, bottle ... same difference. 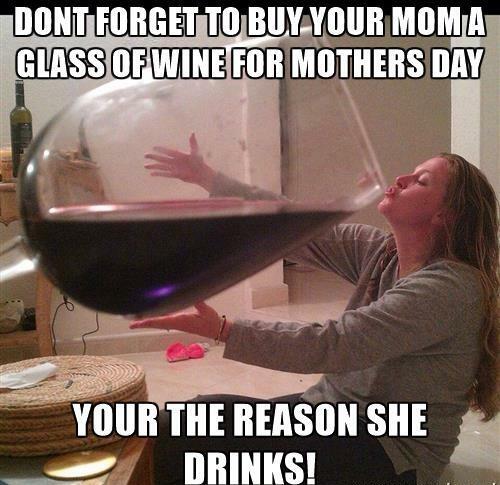 "Don't forget to buy your mom a glass of wine for Mother's Day. You're the reason she drinks!" 10. Nicolas Cage knows what's up. "Today isn't special, because everyday is Mother's Day!" 11. Hope you got them good genes. "Mother's Day on Facebook. 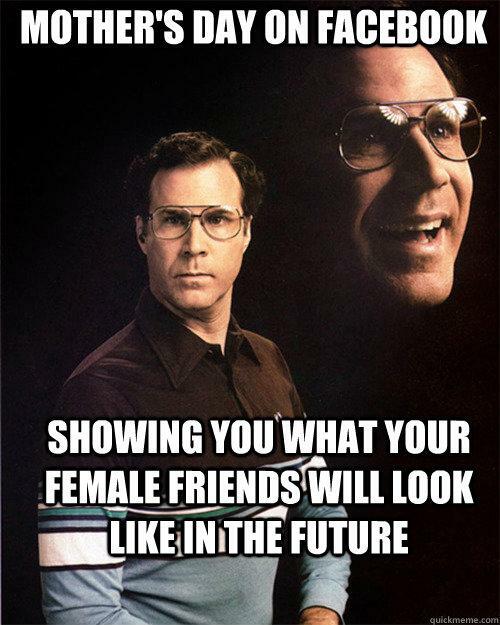 Showing you what your female friends will look like in the future." 12. Give the woman a break for once. 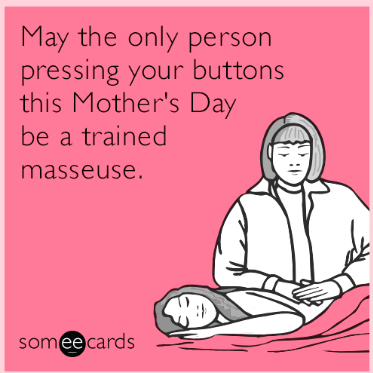 "May the only person pressing your buttons this Mother's Day be a trained masseuse." 13. OK, this one might be a bit dark. 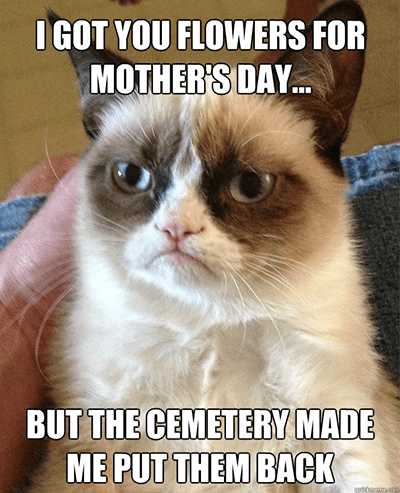 "I got you flowers for Mother's Day but the cemetery made me put them back." 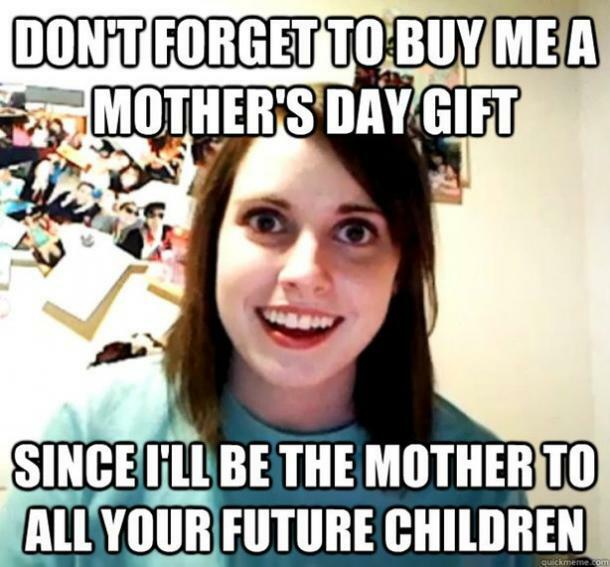 "Don't forget to buy me a Mother's Day gift since I'll be the mother to all your future children." 15. One can never go wrong sticking with the classics. 16. Who loves puns? Moms love puns! 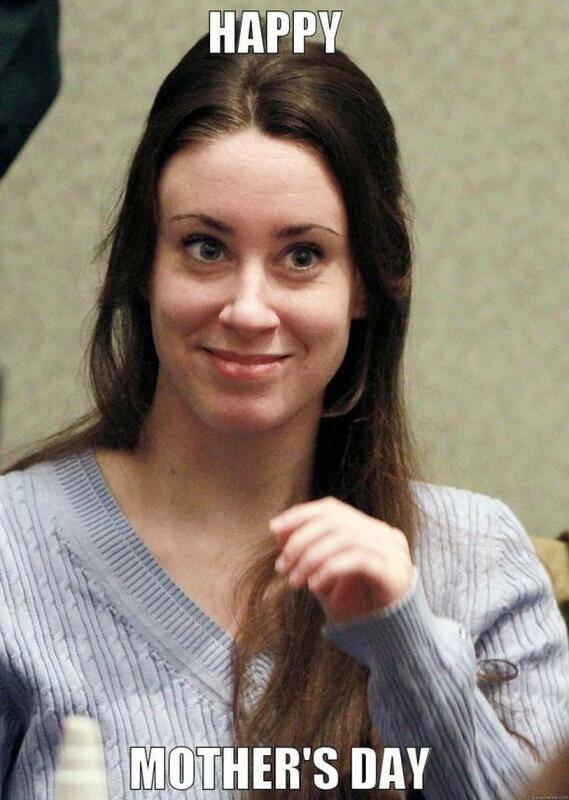 "I know I won't see you, but happy Mother's Day!" 17. I don't think that's what she had in mind, but I'm sure she appreciated the effort. 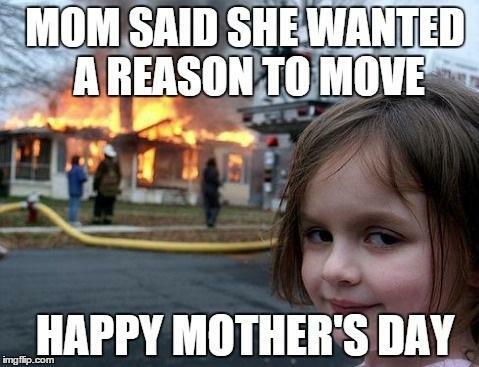 "Mom said she wanted a reason to move. Happy Mother's Day." 18. Pandas make everything better. 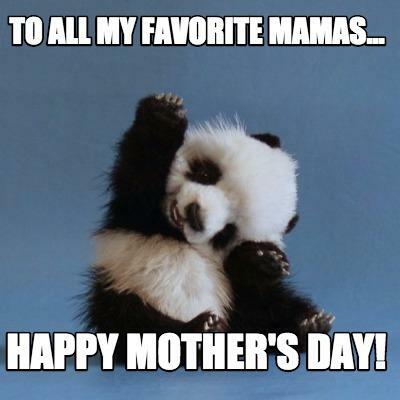 "To all my favorite mamas ... Happy Mother's Day!" 19. Because of course I am. "Mom, I love how we don't need to say out loud that I'm your favorite." 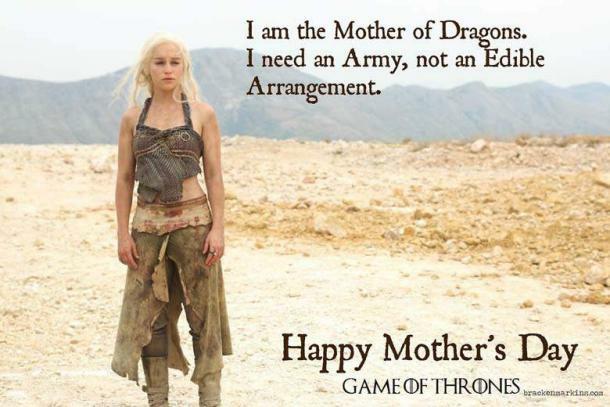 "I am the mother of dragons. I need an army, not an edible arrangement. Happy Mother's Day." 21. The best moms are honest moms. "I've been drinking sine before you were born. 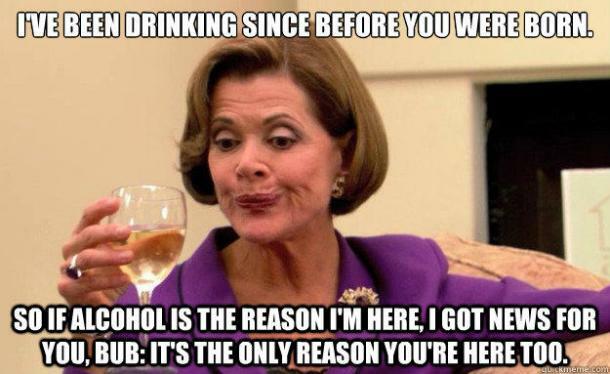 So if alcohol is the reason I'm here, I've got news for your bub: it's the only reason you're here too." 22. "Don't even play like that, Tommy." 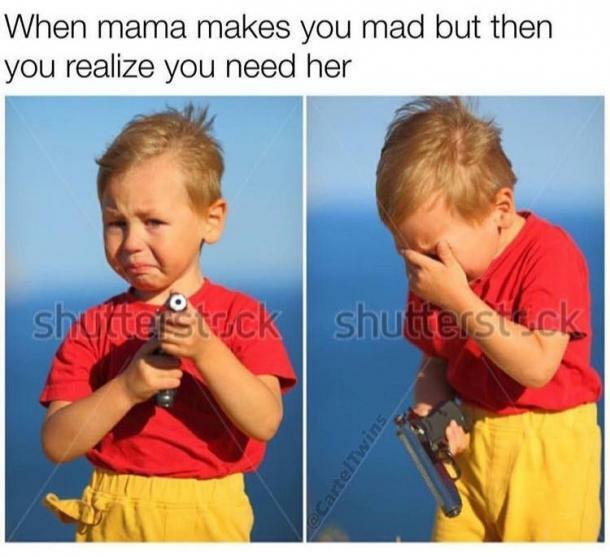 "When mama makes you mad. But then you realize you need her." 24. A face (and gift) only a dog mom could love. 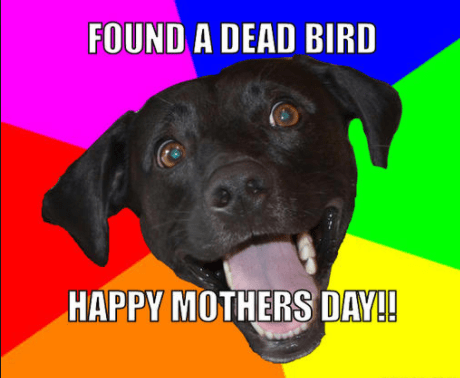 "I found a dead bird! Happy Mother's Day!" 25. Last but not least, the President sends his regards. 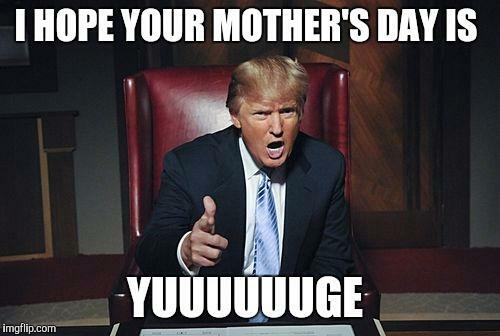 "Hope your Mother's Day is yuuuuuuuge."